You can compare Garmin nuvi models using the chart below, which is designed to help make sense of their myriad models. For a quick overview of the different series, you can also check out my dissecting the Garmin nuvi series post. 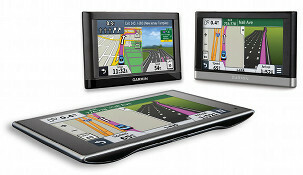 The links in the far left column below go to each Garmin nuvi review on our site. All listed models speak street names and include speed limit and trip log display. Discontinued nuvis are now listed in their own chart. You can also click here for descriptions and more information about various features. NEW: Click on column headers to sort chart. Live traffic – It may not be quite ready for prime time, but it is improving, especially for models with HD traffic. Even so, you can expect lots of inaccurate reports as well as incidents that aren’t reported. Most pre-2013 Garmin nuvis with a T following the model number have ad-supported traffic (see reviews for screenshots). HD models and 2013 T models are ad-free. Bluetooth for hands-free cell phone use – Generally speaking, the sound quality has gotten much better on recent models, but check the reviews (the first column links to these) as it does vary. Powered mount – The power cord plugs into the mount, rather than the GPS. That’s one less connection to fuss with when you want to use your navigator. I’m a big fan of these, especially when combined with a friction mount. Multi-point (multi-destination) routing – A very nice feature, but not a critical one. If the chart says “no,” you can only enter one destination and one or two via points. This isn’t a big problem since you can easily find locations under Favorites or Recently Found. Lifetime map updates – Garmin has started selling units bundled with lifetime map updates, which you can typically download quarterly. Newer models with these have an LM or LMT (the latter includes lifetime traffic) tacked onto the end of the model number. Lane assist – Shows which lane you need to be in for Interstate exits and some surface streets in larger metros. An improved version, active lane guidance, was introduced on the 2013 Advanced and Prestige series. Voice commands – A killer feature and it actually works pretty well on most models. Better yet, how come the Nuvi 55 doesn’t even show up on this website? What is the best for Long Time GPS the 2597 lmt or the 2797 lmt regardless of the sceen site? Hello, I have garmin nuvi 154 LMT. I could’t find it in the list. A. I indicate that I am starting a run. I input the minimum and maximum minutes and seconds per mile that I want to run. As I run, if my CURRENT speed or my OVERALL speed (since I began) is outside of that range, it will tell me. Ideally, it will be by a sound. Second best is that I have to look at it. B. It is self-contained. I don’t need to own or carry anything else. C. After I finish the run, I can also use any PC to display a graph of my speed at each point in time during the run. D. Ideally, I can also print a map of my path. E. How does it know how far I have run? F. The cost of the product. G. The monthly cost and commitment of using it. H. What national (United States) retail chain stores sell it? I. What United States web sites sell and ship it? J. What other functions does it perform? My son purchased me a Garmin Nuvi 2555LM and it is a bunch of crap that doesn’t work. It cuts off and on while driving even with the power cord attached, indicates is fully charged but won’t last 30 minutes, won’t hold a charge etc. Was this model discontinued because I don’t see it on your list? Is there any newer model that is supposed to be comparable and do almost the same thing? Page was useless with an ad covering the table headings. Please do not put ads on you page, or at a minimum, do not let them appear on top of information like table headings. Thanks for saying the voice feature is great! Was like going through the gps systems and thought like hmm, voice command is maybe not that on point yet better wait. But since you say it’s totally good, i’m going for it to get used to it. Because in my opinion in the future a lot of things will become with voice command. So I want to get started with it. My Garmin only says Garmin Nuvi, so what model number is it. Most Nuvi models have a small sticker on the rear of the device that has the model & serial number on it. I have a garmin nuvi. For some unknown reason it wont let me enter the name of the state and location I want. It keeps on saying unknown. I tried to put in New York and it say it can not locate it. I have had this device for several years. Is there something I can do to fix this problem. Check under installed maps. When I did my last map update there was insufficient room (unless i use a SD card) so I had to choose a region for the installation. I chose east which covered Canada and US down to FL and later updated again with an 8GB SD card in place to get the full North American map. Please keep in mind that map options may vary dependent on the model. I have a 2555LMT. How does a NUVI series differ from the others ? I am looking to buy a refurbished unit—or simply a used one in working condition!—that has the old-style address input. I can’t tell from this chart what years these models are—are they all new ones? I just spent minutes—5 or 10—looking for 90 Ridge Road, Mahwah, N.J. on our new unit—it searches 5 states, finds all sorts of Ridge Roads, Avenues, Ridgewoods, etc., etc., in all 5 states, but not that address, which came up as the #3 choice on Bing maps on my laptop. So I printed the address and maps for Mom, but really want to go back to the old-style address: put in state first (only if it changed from last state), then town, then street name and number—more entries, perhaps, but one solid result. Even if for some reason it does not recognize the house number, it will get you to the road. We recently replaced Mom’s old unit—one of the first, when my sister was given a $300 novelty—that finally gave up the ghost; mine, bought a few years ago, still has old-style addresses, but when I bought the new one, I called to see if address input could be modified—no, it cannot; apparently people like to do on a GPS what they do on a smart phone or map site on a computer; too bad about efficiency or anyone who wants something different!